The June Bateman Fine Art is pleased to present "Towards Summer", a solo exhibition of black and white photographs by Boston based artist John Goodman. "Towards Summer" features over thirty silver gelatin landscapes and portraits from Goodman's series on Cuba, the Boston Ballet and his personal portrait series, organized around themes of bodies at rest and in motion, in languorous repose and frenetic activity, reflecting the impending heat, relaxation, and anticipation of summer. By turns cooly studied microcosms of form or masterfully executed compositions of light and dark, John Goodman's images come from a classic black and white tradition harkening back to his studies with Minor White from 1972-1974. Goodman does not purport to be recording events as they are but instead has a "highly personal, even idiosyncratic subjective vision.," while embracing more modern notions of movement and deconstruction. In Goodman's languid still-portraits of friends and family (which began as a series in 1997), the moment is held in private. Through gestural, ambiguous images of interlocking hands, the cradling of a head, or an unexpected glance, Goodman explores an intimate geography of the human form, inviting a gradual discovery of the landscape as a series of gently intersecting planes, furrows and valleys bathed in a luminous light. 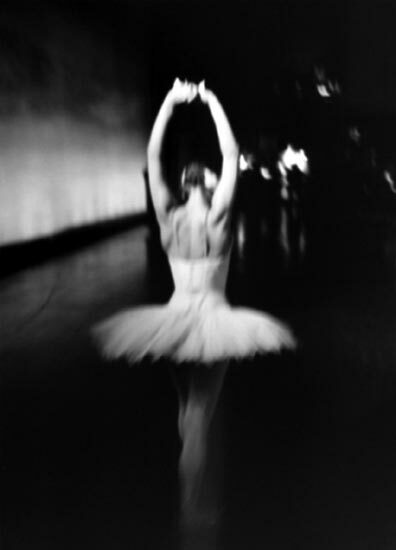 By contrast, the Cuba and Ballet photographs included in the exhibition are inspired by Goodman's love of urban street images from the 1940's through the 1970's which were the starting point for the series shot in Havana Cuba in 2000 as well as for the new Ballet images photographed in Boston in 2004. Both series include energetic works capturing impressions of motion and the atmospheres of worlds full of unbridled vitality, depicted in swirling chiaroscuro. John Goodman is a fine art, editorial and advertising photographer. His work is included in numerous personal and public collections, including the permanent collections of the Art Institute of Chicago, MFA/Boston, SF/MOMA, NY Public Library and the Fogg Museum, and the collection of Henry Buhl, New York. Goodman teaches photography at the Maine Photo and Toscana Photo Workshops. Images from Goodman's 1996 Monograph, "The Times Square Gym" were widely exhibited in the United States and Canada, and bore witness to the final days of a great boxing gym before "progress" made its way to Times Square. Mr. Goodman has been profiled Black & White Magazine and in Camera Arts. His photographs have been published in numerous journals and magazines, including Doubletake Magazine/Issue 10, Zoom International, Communication Arts Annual, and The Body; Polaroid International Photography No. 23. "Towards Summer" opens on Thursday, April 22, 2004, and will run through Saturday, June 5, 2004. An artist's reception will take place on Thursday, April 22 from 6 to 8 P.M. The gallery is located at 560 Broadway, Suite 309, and is open Tuesday through Saturday from 11 A.M. to 6 P.M.